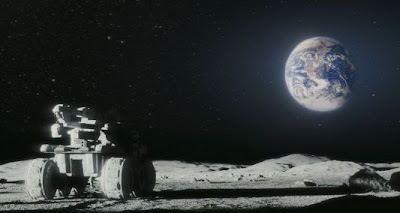 Moon (2009), directed by Duncan Jones (aka Zowie Bowie) and based on his original story, is a science-fiction film set in the not-too-distant future. Despi te some thematic reservations I have with the film, it has an eerie seductiveness that lingers in the memory. The story begins with a quick contextual positioning some years hence in the future at which time mankind’s energy crisis has been solved by mining rich energy resources from the dark side of the moon. At a lunar mining station there Sam Bell is the lone human being in attendance and is near the completion of his contracted term. His only companion during the last three years has been a computer robot, named “GERTY”, which speaks to Sam in a soothing voice and controls all the electro-mechanical functions at the mining station. Anyone familiar with Stanley Kubrick’s 2001: A Space Odyssey (1968) will make the immediate connection with that film, and that association may be explicitly intentional. From the very outset we are suspicious of Gerty and the degree to which Sam is in control of his situation. Since one of the film’s virtues is its air of mystery, the reader is hereby warned that principal elements of the mystery will be revealed in what follows. 1. Isolation. 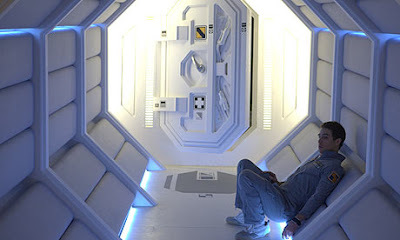 In the first phase, Sam is shown to be going slightly stir crazy and given to hallucinating after almost three years of claustrophobic loneliness. Because direct satellite communications with the earth are apparently not working, Sam is only able to familiarize himself with the latest news from his wife back home via video recorded messages that she sends to him. Otherwise, he goes over his work schedule with Gerty, runs on his treadmill, and spends free time making wood-carving models with his pocket knife. Given the fact that almost all of his interaction in the world is via mediated electronic and electro-mechanical devices, this wood-carving activity seems to constitute his only direct and authentic interaction with physical reality. This section may remind us of our own increasingly mediated existences and the degree to which we are becoming isolated from direct interaction. 2. Identity. One day while inspecting some mining equipment away from the station, Sam crashes his rover vehicle and is severely injured. 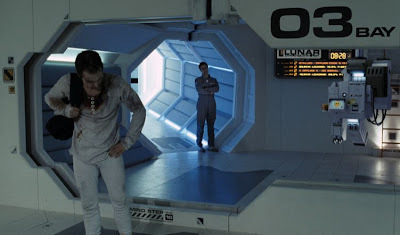 The next scene shows him waking up in the station infirmary, with Gerty soothingly informing him that he has been “out ” for some time and has suffered some memory loss from a concussion. Because Gerty restricts his access to some facilities during his convalescence, Sam becomes suspicious and sneaks out to the accident site, where he discovers the damaged rover vehicle with a body in it. When the body is brought back and revived, he discovers that it is a copy of himself: there are now two Sams at the base. Apart from the distinction that one of the Sams (Sam1) is injured, we soon see that though they are physically the same, the two Sams have some differences. Sam2 is something of a control-freak and a hothead, while Sam1 is laid-back and more accepting of their present circumstances. In this section, the two Sams have to come to terms with just who he (or they) are and what constitutes their individual entities. After some time it is clear that Sam2 is a biological clone of Sam1 and that Sam1 knows a little more about “their” past than Sam2. The mining company has stored clones in the base station for quick replacement in case their human agents die during service. Gerty had mistakenly replaced Sam1 with Sam2, assuming that Sam1 wouldn’t live. We also learn that Sam1 used to be hot-tempered control-freak, too. The agreed-separation from his wife and child while working on the Moon had been intended for him to learn how to manage his own emotional weaknesses, and this apparently had met with some success. So Sam1 tries to impart some of his recently gained philosophical wisdom to the impatient Sam2. 3. Departures. The two Sams, now feeling a sense of brotherhood, realize that the mining company will not allow more than one Sam to live, so they decide to escape together. This can be accomplished by reviving another clone to serve on the station. Sam1 also learns that he, himself, is a also clone and that the real, original Sam must have died years ago. But Sam1 is rapidly degenerating physically and experiencing persistent internal hemorrhaging. He knows he is not going to survive, so he volunteers to be placed back into the damaged rover vehicle to help cover Sam2's escape. Sam1 dies, and Sam2 makes it back to Earth. There are a few remaining, unresolved questions I have about the story. What were Sam’s hallucinations in the first phase of the film about? They seem to be present in the narrative only to set up the crash, but they suggest something of importance which is then abandoned. Sam1's physical degeneration is puzzling. Was it due to the crash? He seemed to recover somewhat after the crash, though, only to decline rapidly subsequently. Or are the clones designed to be functionally operational for only about three years, after which they degenerate? Gerty’s role (voiced creepily and effectively by Kevin Spacey) is also unclear. He secretly communicates with the mining authorities on Earth sometimes, but later apparently doesn’t divulge to them that there are two Sams alive at the station. He explains that he is programmed to help humans (like Kryten on the TV series Red Dwarf), but the implications of this interesting humanistic directive are left unexplored and the evocation of associations with 2001: A Space Odyssey seem to be only a red herring. Still, for a debut effort on a limited budget, one has to admire what has been produced. There is really only one actor of significance in the film, yet the visual narrative remains fascinating throughout. 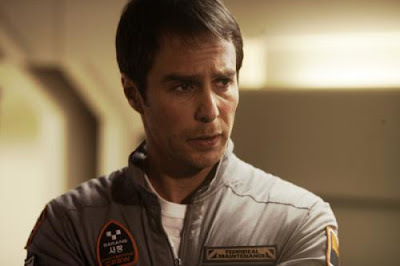 There is a clever action scene in which Sam1 plays ping pong with Sam2, and of course both Sams are played by actor Sam Rockwell. Clint Mansell’s pensive music sets contemplative mood for the themes of loneliness and human meaning. showing the earth hovering in the sky when the station is supposed to be on the "dark side of the moon" (assumed to be colloquially identified with the far side of the moon, because the true dark side of the moon would not identify a fixed location). But the entire premise of the film is based on the unsound idea: that the human mind is a mechanical computing substrate, onto which all the memories of someone can be “uploaded”. This involves confusing the physical mind-embodiment of real, human existence with the digital computing metaphor of a Turing machine. Although it is true that there are a number of people, even academics and computing professionals, who believe that the human mind is equivalent to an algorithmic computer, this belief is incorrect. The human mind can simulate (not very efficiently) the operations of a logic computation machine, but its operational and interactive capabilities go beyond the mechanics of computers. Sam1 and Sam2 might be identical twins, but they are not, and cannot be, identical copies of each other. It will not be possible to upload the memories of one person onto another. Interesting article would not prevent to see the movie. reminds me of Fiodor M. Dostoievski = "The Double". Definitly he thought about the dark side of the moon for the reason that = more likely landing upon the visible moon is impossible from the radioactive rays being absorbed and flirting upon the surface ; Van Allen radiation belt make the surface feel like a microwave burning. This because there is no atmosphere upon the moon moreover tthe moon is static not orbiting equatorially upon azimut. Each man wants to put is Stone into something but the brick relays also to the elementary process of nature evolution. Without these we come again to the cycling elementary process of a vinyl being scratched ; the way is lost and the aging proceess cannot have a longevity = it is shown in Blade Runner by Ridley Scott exactly the same way... the clone would not have the aging of his memory being achived in time ; in alchemistery it is where you loose the gold. You can say same of a wine it is not young and good because it has a quality sépage and it also had endured the time and length as it is made with empathy - the empathy of a clone cannot simulate having an experience of the life itself it is too fresh and the knowledge being limited, limits also to achieve the longevity. I think that the clones are programmed to degenerate after three years. Remember when he sees the videos of previous clones all also falling apart. As for seeing the earth from the dark side of the moon, that certainly is possible. The dark side is dark because it faces away from the sun, not the earth. i liked your post . the movie is also fabulous. i will give it a decent 3 star. I think of 'Waiting for Godot". It has an existential feel,and a Freudian subtext came to my mind- but as a woman I was struck by the alienation of man from woman, man from child, the way the family has disintegrated over these years, so that a father can not even be sure that his daughter is his own child. The images of the wife and husband yearning for each other in little movements, the way Sam stroked his chin when talking to his wife as if it were her own hand upon his flesh, his broken voice when he asked how old his daughter was. I do not think we need to be too worried about facts about where the moon and sun are when faced with a work of art which talks about the human condition. One could just as well criticize Shakespeare for including fairies in his plays, or balk at the running of a Rhinoceros down a village street. Certainly this is a great movie, I really like the acting of the kid. such a great story and has a great moral as well. I will advice to people watch this movie.